A head hunters dream in a Half Arabian mare. With perfect ears and a long graceful neck that joins flawlessly into her withers she is a beauty to behold. Pirouette has matured close to 17 hands tall, statuesque and elegant. An incredibly deep shoulder balanced with a huge hip for beautifully fluid movement. Pirouette's dam is a full sister to a leading sire of Dressage Champions and her sire, Double Tstandard has a high percentage of champion get, most showing in Dressage and Sport Horse disciplines. Pirouette has been shown at halter, winning the blue and reserve champion. She is handled daily and is solid in her ground work. A wonderful prospect for Dressage or Sport Horse and later a broodmare supreme! 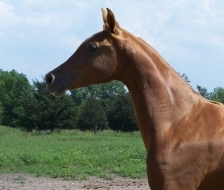 Registered Half Arabian, eligible for several other registries including NSH.